Digital First Media (DFM) owns publications in several US markets. Their biggest properties are located in California, Colorado, and Minnesota. DFM outlets publish breaking news, opinion, analysis, as well as feature reporting on topics such as sports, politics, national, and lifestyle news. Many DFM properties include a print newspaper component, like the San Jose Mercury News, Denver Post, and St. Paul Pioneer-Press. Online, DFM sites are mostly text-based, however there has been a move towards more video and multimedia content delivery. Prior to Alley’s work, DFM sites used a number of legacy systems, including the commercially available Methode and the proprietary NGPS. Because the different outlets had unique technology configurations, the DFM team had to build separate solutions to fix identical workflow issues. Cross-company product decisions were hampered by the need to implement separate approaches for each outlet. DFM needed to streamline their internal technology offerings in a way that was user-friendly for their editorial teams, readily adaptable for future product innovations, and easily maintainable with one centralized technology staff. Goals of the project included design solutions that uniquely identify each outlet while retaining a company-wide familiarity, an easier way to syndicate content within DFM properties, a simpler way to manage online advertisements, and an overall decrease in maintenance costs. DFM decided that a content management system on the WordPress.com VIP Go platform best suit their needs and engaged Alley to develop a company-wide solution on an outlet-by-outlet basis. Alley and DFM began the process with a thorough kick-off meeting. The Alley team, lead by Partner and Chief Strategy Officer Brad Campeau-Laurion, traveled to DFM headquarters in Denver, Colorado, along with representatives from DFM outlets in Denver, St. Paul, San Jose, and Los Angeles to participate in this meeting. After this initial company-wide meeting, DFM decided to launch twincities.com first, followed by denverpost.com a few months later, then the Bay Area News Group properties, and, finally, the Southern California News Group (SCNG). Subsequent local kickoff meetings were held in St. Paul, Denver, San Jose, and Monrovia, California, before work commenced on each phase of the project. During the initial kickoff, Alley’s Director of User Experience Susan Finkelpearl ran exercises to help the publications identify their ideal information architecture and highlight their top design concerns. Answers were consolidated to create an underlying design that would connect the DFM properties to each other while still allowing for outlets to retain visually unique identities. Local identities were created during subsequent kickoff meetings prior to each individual outlet’s development. Our designers took inspiration from regional colors, environments, and traditions to build each site. For instance, the Denver Post team recognized silver as a notable aspect of Colorado history, and Alley’s design team worked to incorporate that into the design of the site. The different properties of SCNG were organized based on geography and landscape, with outlets closer to the ocean receiving a cooler blue treatment and outlets located in more desert conditions styled in warmer, earthier tones. 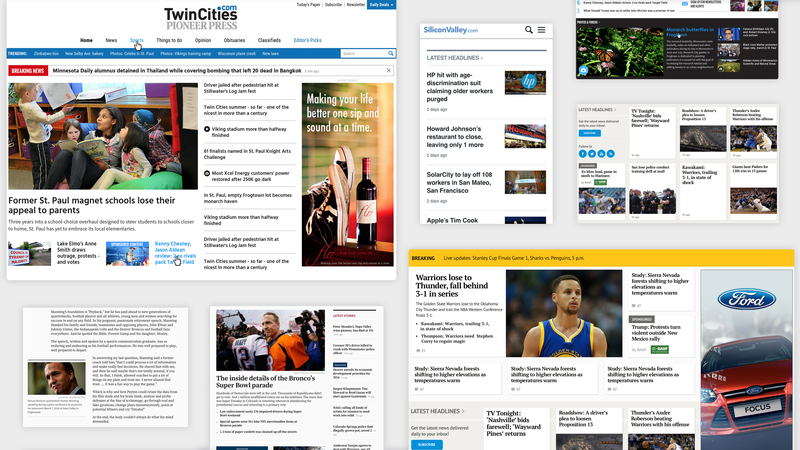 The first site, twincities.com, launched in early 2016 and included a custom-built “wire hub” that site editors could use to import AP and other wire stories into the CMS. 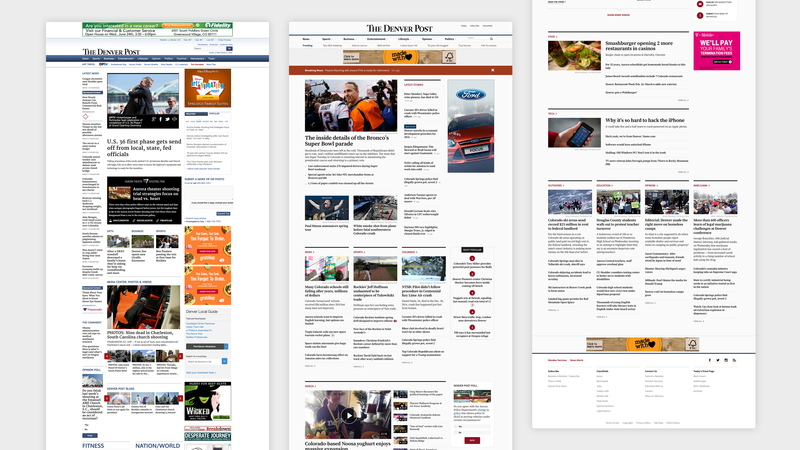 The launch of denverpost.com a few months later included both the wire hub and a DFM-specific “content hub” that editors could use to syndicate articles amongst the DFM outlets. Syndication through the content hub became an instrumental part of the operation of the Bay Area News Group, where syndicated subscriptions helped automate content sharing between mercurynews.com, siliconvalley.com, and eastbaytimes.com. The Southern California News Group took syndication a step further. Together with the DFM team, Alley created a WordPress-based universal dashboard to eventually power all 11 sites in the SCNG family, including ocregister.com, pe.com, and dailynews.com. Reporters and editors throughout SCNG use the universal dashboard to file directly to any site as well as syndicate their story to appropriate outlets within the SCNG family. Alley used an in-depth observation and training program to introduce the mechanics of the new CMS to each site’s editorial team before launch day. For DFM, this involved in-person training sessions at each outlet’s newsroom, which allowed us both to demo the new CMS in a familiar environment and to evaluate each team’s preexisting workflow. During their training, the journalists logged in to a private version of the new site that the DFM team created for these exercises. The separate training site gave the staff hands-on experience and the opportunity to interact directly with the CMS as we demonstrated the new tools. By the end of the training sessions, the entire editorial staff had experience with the new editing system and saw how the changes improved their daily workflow. In addition to the in-person sessions, Alley created customized training materials for each editorial team, including written step-by-step instructions, GIFs and videos demonstrating common tasks on the site, and answers to frequently asked questions. Since these training materials were created in Google Docs, they can be updated by the publisher and used as living documentation to onboard new members of the newsroom. All of the new sites use Alley’s Ad Layers plugin to help manage their online advertising. This allows ad ops teams at each individual publication to customize ad delivery without developer involvement. Streamlining the DFM sites allows one centralized team at DFM to oversee all site maintenance. Since all of the DFM sites are all on the WordPress.com VIP Go platform, the DFM team can use the same solution across multiple sites when workflow issues arise.